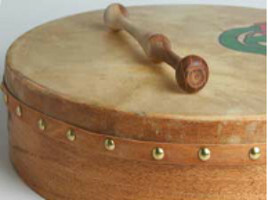 The Bodhrán (pronounced bow-rawn), is the traditional Irish drum. Uniquely played in a seated position, the instrument is held vertically on the player's knee and supported by his upper body and arm. A goat skin head is tacked to one side and the other side is open ended for the left hand to be placed against the inside of the drum head to control the pitch. The drum is played either with the bare hand or with a lathed piece of wood called a cipín, tipper or beater. 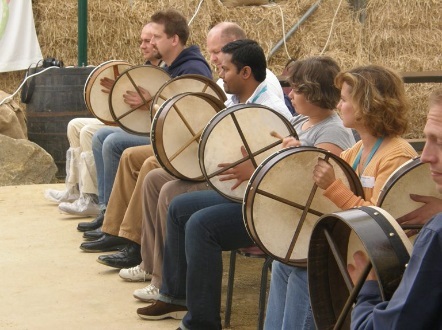 The Orchard Centre’s Bodhrán Workshop has provided many of our guests with a shared experience of group achievement. 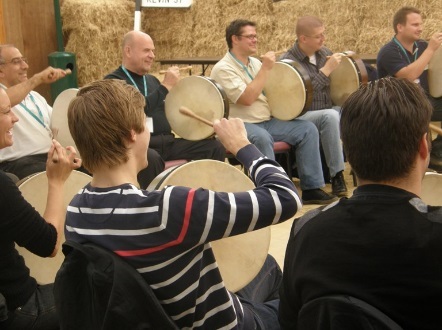 The Bodhrán is the heartbeat of Irish traditional music. Capable of surprisingly complicated rhythms, allow the music to express your own team rhythm and team spirit. You don’t need to be able to read music to play; get yourself a Bodhrán and you will soon be able to join in with the music. Our expert tutors will take you where you have never dared as you experience the mystical beat of Irish Traditional music.